James B. Comey, then the F.B.I. director, with Attorney General Jeff Sessions during a meeting at the Justice Department in February. The Justice Department typically walls off the White House from criminal investigations to avoid even the appearance of political meddling in law enforcement. But Mr. Trump has repeatedly interjected himself in law enforcement matters, and never more dramatically than in his private meetings with Mr. Comey. F.B.I. officials were also unsure whether what Mr. Trump had done was a crime or how the conversation could ever be corroborated. So Mr. Comey kept the circle of officials at the F.B.I. who knew about his interactions with Mr. Trump small because he did not want agents and analysts working on the case to be influenced by what the president wanted. 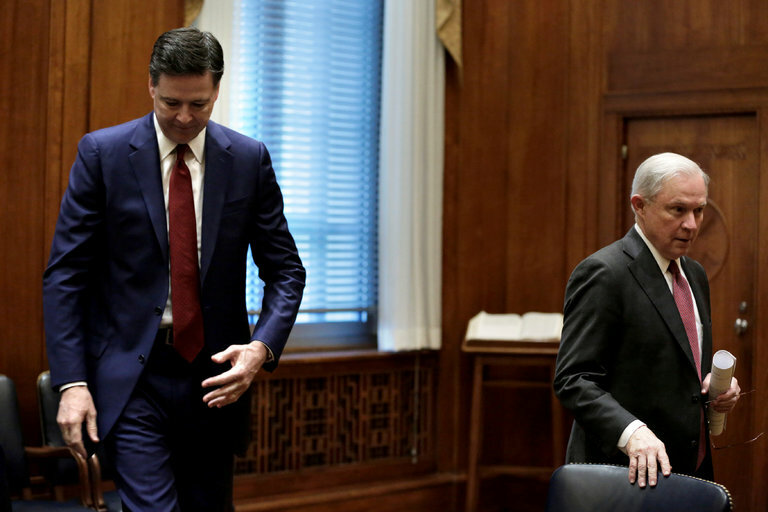 Mr. Comey’s decision to keep his interactions with Mr. Trump a secret from the Justice Department were the latest example of how he set himself apart from the department throughout his tenure at F.B.I. director. Several times during the F.B.I.’s investigation into Hillary Clinton’s personal email server last year, for example, Mr. Comey made decisions without the Justice Department’s knowledge or approval, often to the consternation of Loretta Lynch, then the attorney general. Mr. Comey has said he made those decisions to protect the independence of the F.B.I. — decisions that have been praised and criticized along partisan lines. Mr. Comey is also likely to be asked Thursday what he told Mr. Trump about the Russia investigation. Mr. Trump has told aides and said publicly that, on three occasions, Mr. Comey assured him that he was not under investigation. While Justice Department policy allows authorities to tell people whether they are the target of an investigation, prosecutors — not F.B.I. agents — handle such discussions. “We typically do not answer that question,” Mr. McCabe testified recently. When the Justice Department transferred the Russia investigation to Mr. Mueller, it gave him the authority to investigate whether the president broke any laws by attempting to obstruct the case or by firing Mr. Comey. As F.B.I. director, Mr. Comey wrote a detailed memo after every major phone call or meeting with Mr. Trump and left those memos in the bureau’s files when he left. As special counsel, Mr. Mueller has access to those memos, but the F.B.I. declined a request from the Senate Intelligence Committee for copies of the memos, citing the ongoing investigation. It is unclear whether Mr. Comey still has copies of all of them or plans to read from them during his testimony. According to people briefed on the memos, they describe not only what Mr. Trump said, but details such as his tone and where he was sitting. In one memo, Mr. Comey described a dinner with Mr. Trump at the White House a week after the inauguration in January. Mr. Trump asked Mr. Comey to pledge his loyalty but Mr. Comey refused. It was in that conversation that Mr. Trump asked Mr. Comey to end the investigation into Mr. Flynn, and encouraged him to investigate leaks, the people said.